Our last morning in the little town of Launceston (population 80,000). Bad news this morning. A family crisis had arisen over night for Helen that meant she felt she had to leave us, at least for a few days. By 9.00 am she had left for the airport and was gone. And then there were 4. We were very sorry to see her go……..
We packed up and were ourselves gone just after 10.00. First stop was the town to take on supplies. Cradle mountain is going to be quite spartan by all accounts. 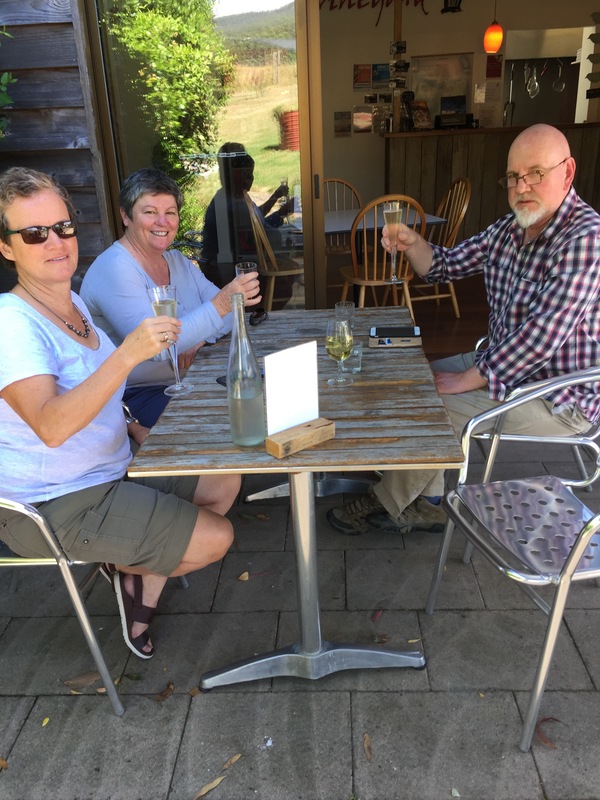 As rain was forecast for the area to which we were ultimately heading, we decided to detour through the Tamar valley wine country to make the most of the sunshine. This meant a route to the right hand side of the Tamar, which becomes a broad waterway as it leaves Launceston behind. (Authors note: In my previous reference to the Tamar I referred to it as the longest waterway in Australia, thanks to Jenny Wightman I now know it is the longest waterway in Tasmania. Thanks Jenny!) it was a green and pleasant land of fields and trees. As always, there was very little traffic. We had decided to stop at a vineyard that advertised food to incorporate a lunch srop with a wine tasting. 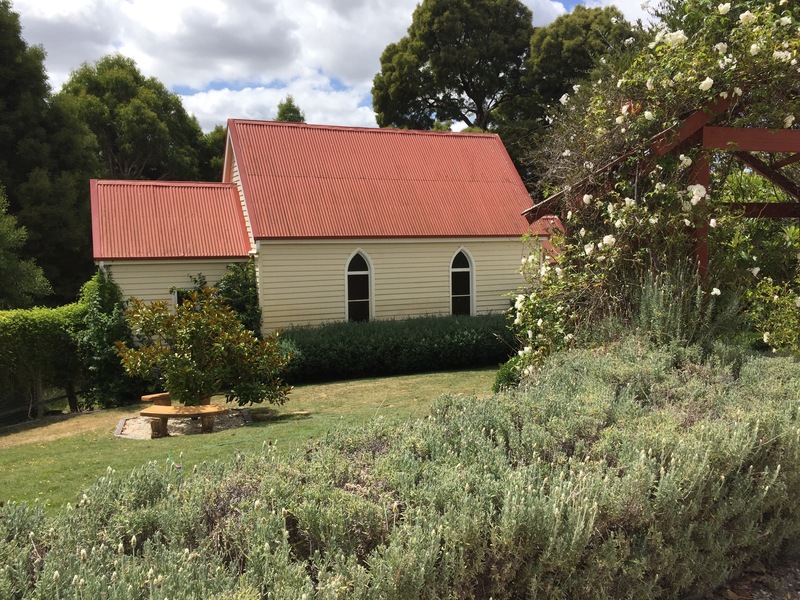 The Leaning no Church Vineyard seemed to cater for all our needs – and so it proved! 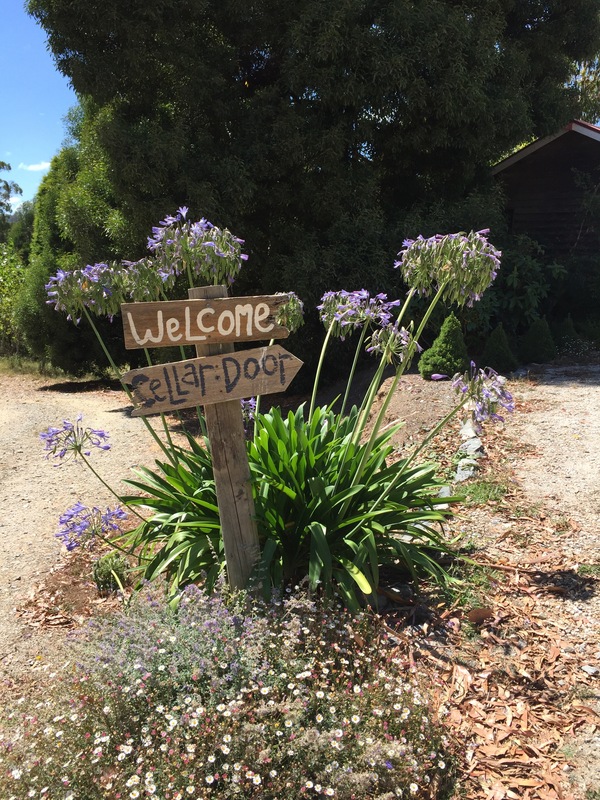 The wine on offer was good and the food exceptional. Keith and opted for a shared platter of local foods which was excellent and Wendy and Sarah had scrumptious vegetarian dishes. Keith and Sarah washed theirs down with a sparkling white and I, very unusually, opted for the Chardonnay which I thought amazingly good as a non Chardonnay drinker. We sat under the shade looking out onto the garden and had a thoroughly good lunch. It was delicious! Having inspected the ‘leaning church’which showed absolutely no sign of being off centre, we took to the road again, crossing country back to the Tamar. Once again we moved through wonderful countryside. We reached the river and crossed the bridge and drive down to a place called Dolerain where we had been told there was a good bakery. There was. We picked up an excellent loaf even though it was late in the day. It was an interesting town. There were a lot of arty shops – being run, it seemed, by aging hippies. I described it as having a feeling of Glastonbury without the joss sticks! 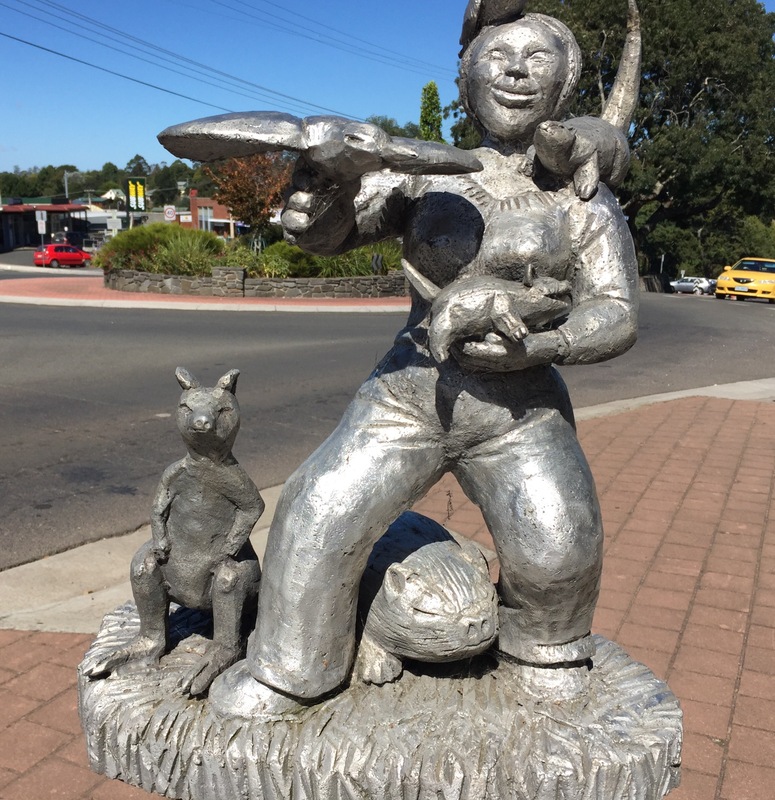 There were some very odd sculptures about the place on black plinths……. e.g. Hmmmmmm…. Taking our leave of Dolerain, we headed to our final destination. Cradle Mountain. As we neared the area a long ridge of mountain range rose up to our left. Trees seemed to grow up to quite a height. Gradually the road became more twisty and as we climbed up. There was dense, lush forest either side intially, but this gradually became more open with a lot of dead trees on the ground as though efforts were continuing to clear the area. There was no sign of the expected rain. So much for our detour to to avoid it!! We eventually arrived at the Discovery Park lodge site. We booked in at the reception and arrived at our home for the next few days, hut 26 . It was compact but very clean. Helen, had she been with us would have had a little bunk over one of the double beds. Cosy! !